Black Canary is something of an oddity among DC characters. Like the Flash, the original Black Canary has been replaced by a successor, but unlike the switch between Barry Allen and Wally West, there was no grand and momentous transfer of the title. In fact, no one even knew it had happened until several years after the fact. A stunning siren who is able to project a sonic scream, bringing criminals to their knees. A master martial artist, she also engages in hand-to-hand combat. The original Black Canary was Dinah Drake, the daughter of a police detective. Rejected for the police academy, she still achieved her dream of being a crimefighter by creating a secret identity. Originally she stole from criminals; how this was supposed to make her a legitimate hero, I don't know. She first appeared as a supporting character for JSA-er Johnny Thunder, but soon usurped his place in the back of Flash Comics and took on a life of her own. 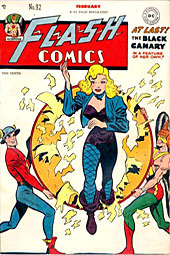 Canary's costume was obviously inspired by the era's pin-up girls: black leather bustier, bolero jacket, fishnet stockings and high-heeled boots. 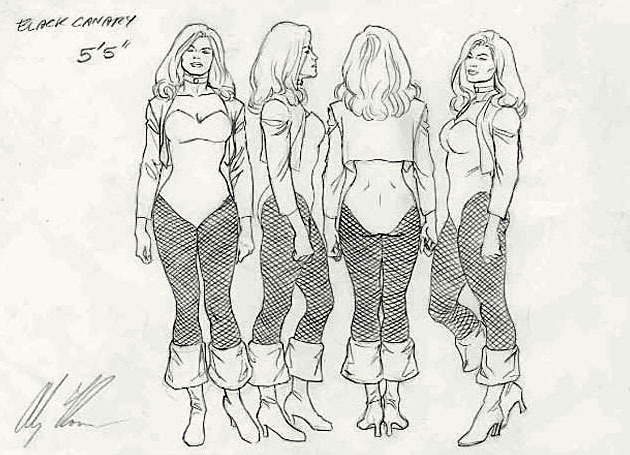 Alex Ross tends to make her look more voluptuous than his other female characters, but that makes sense: spandex is shaped by the body beneath it; a corset changes the body to make it fit. So while it might be hard for Dinah to breathe in this outfit, she'd definitely be curvy. The paint on this figure is great. It's not just that she's solid black, but that they chose a great glossy paint to capture the look of the leather. The apps are all very tight, with no obvious mistakes where the skin meets the costume. Her blonde hair has shadows and highlights, and even her fingernail polish is placed well. DCD has been having some paint problems of late, but none of them crept in here. Like a lot of comic artists, Alex Ross will often base his characters' appearance on celebrities, so they don't just look like generic faces. Dinah gets that treatment, and the real-life woman behind the design is none other than Blondie frontwoman Deborah Harry. It makes a certain kind of sense, since Harry bleached her hair and Black Canary wears a blonde wig to help conceal her identity. Black Canary is actually above-average in terms of articulation - at least in relation to the rest of the Alex Ross figures. She moves at the neck, shoulders, elbows, forearms, hips and knees. Her well-coiffed hair keeps her head from turning, but the fact that DC was smart enough to create joints where her arms emerge from their sleeves is good. They might have done the same at her boot tops, but there's a good reason they didn't. Those trademark fishnets of hers aren't sculpted on, and neither are they just a simple paint app. In fact, they're genuine stockings that float over her legs. They're held in place where her legs meet her boots, and if that was a joint, there would be a greater chance of them coming undone. Her jacket is a softer plastic, separate from her torso. It's not removable, but she is fully sculpted beneath it. By the time the JSA started having yearly crossovers with the JLA, Dinah had married her romantic interest, Larry Lance. When he was killed in '69, she decided to stay on the Justice League's Earth (DC still had multiple Earths at that point) and even joined the team, sticking with it through several incarnations. Then Crisis happened, and there was just one world with one timeline that included both groups. Canary's old teammates were, well, old teammates, while she was still young and spry. How'd that happen? Turns out that Dinah Drake Lance had a daughter, Dinah Laurel Lance, who grew up to follow in her mom's bootsteps. Dinah Jr. was the one who joined the JLA and hooked up with Green Arrow, and she was the one who had the supersonic lungs. Pretty major retcon, but clever.